Environmental Protection Agency Administrator-designate, Oklahoma Attorney General Scott Pruitt is seen on Capitol Hill in Washington, at his confirmation hearing before the Senate Environment and Public Works Committee. Pruitt has spent millions of dollars in taxpayer funds on unprecedented security precautions that include a full-time detail of 20 armed officers, according to agency sources and documents reviewed by The Associated Press. WASHINGTON (AP) — Environmental Protection Agency chief Scott Pruitt's concern with his safety came at a steep cost to taxpayers as his swollen security detail blew through overtime budgets and at times diverted officers away from investigating environmental crimes. Altogether, the agency spent millions of dollars for a 20-member full-time detail that is more than three times the size of his predecessor's part-time security contingent. EPA spokesman Jahan Wilcox cited "unprecedented" threats against Pruitt and his family as justification for extraordinary security expenses such as first-class airfare to keep him separate from most passengers — a perk generally not available to federal employees. But Pruitt apparently did not consider that upgrade vital to his safety when taxpayers weren't footing the bill for his ticket. An EPA official with direct knowledge of Pruitt's security spending said the EPA chief flew coach on personal trips back to his home state of Oklahoma. The EPA official spoke on condition of anonymity for fear of retaliation. New details in Pruitt's expansive spending for security and travel emerged from agency sources and documents reviewed by The Associated Press. 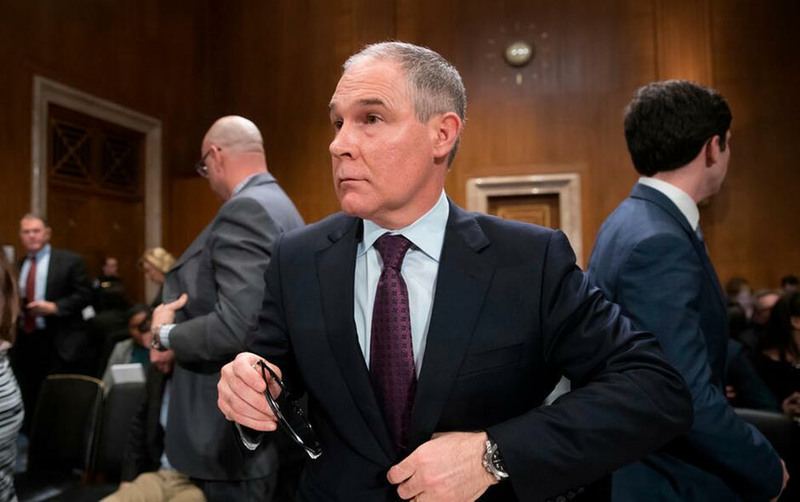 They come as the embattled EPA leader fends off allegations of profligate spending and ethical missteps that have imperiled his job. The EPA official knowledgeable about Pruitt's security spending says Perrotta oversaw a rapid expansion of the EPA chief's security detail to accommodate guarding him day and night, even on family vacations and when Pruitt was home in Oklahoma. The EPA official said there are legitimate concerns about Pruitt's safety, given public opposition to his rollbacks of anti-pollution measures. But Pruitt's ambitious domestic and international travel led to rapidly escalating costs, with the security detail racking up so much overtime that many hit annual salary caps of about $160,000. The demands of providing 24-hour coverage even meant taking some investigators away from field work, such as when Pruitt traveled to California for a family vacation. The EPA official said total security costs approached $3 million when pay is added to travel expenses. Wilcox said Pruitt has faced an unprecedented number of death threats against him and his family and "Americans should all agree that members of the President's cabinet should be kept safe from these violent threats." Pruitt has said his use of first-class airfare was initiated following unpleasant interactions with other travelers. In one incident, someone yelled a profanity as he walked through the airport. But on weekend trips home for Sooners football games, when taxpayers weren't paying for his ticket, the EPA official said Pruitt flew coach. The source said Pruitt sometimes used a companion pass obtained with frequent flyer miles accumulated by Ken Wagner, a former law partner whom Pruitt hired as a senior adviser at EPA at a salary of more than $172,000. Taxpayers still covered the airfare for the administrator's security detail. Walter Shaub, who until last year ran the federal Office of Government Ethics, said it is a potential ethics violation for Pruitt to accept the airline tickets, even if Wagner didn't pay cash for them. Federal officials are barred from accepting gifts from employees that have a market value of more than $10. 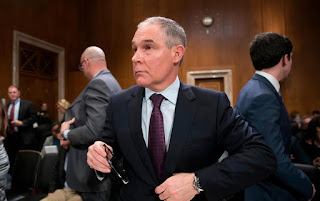 "It would be a very serious ethics problem, indeed, if Pruitt accepted airline tickets from a subordinate," Shaub said. The EPA administrator has come under intense scrutiny for ethics issues and outsized spending. Among the concerns: massive raises for two of closest aides and his rental of a Capitol Hill condo tied to a lobbyist who represents fossil fuel clients. At least three congressional Republicans and a chorus of Democrats have called for Pruitt's ouster. But President Donald Trump is so far standing by him. A review of Pruitt's ethical conduct by White House officials is underway, adding to probes by congressional oversight committees and EPA's inspector general. EPA's press office has refused to disclose the cost of Pruitt's security or the size of his protective detail, saying doing so could imperil his personal safety. But other sources within EPA and documents released through public information requests help provide a window into the ballooning costs. The EPA official who spoke to AP said Perrotta also arranged the installation of a $43,000 soundproof phone booth for Pruitt's office. At least five EPA officials were placed on leave, reassigned or demoted after pushing back against spending requests such as a $100,000-a-month private jet membership, a bulletproof vehicle and $70,000 for furniture such as a bulletproof desk for the armed security officer always stationed inside the administrator's office suite. Those purchases were not approved. But Pruitt got an ornate refurbished desk comparable in grandeur to the one in the Oval Office. Among the officials who faced consequences for resisting such spending was EPA Deputy Chief of Staff for Operations Kevin Chmielewski, a former Trump campaign staffer who was placed on unpaid administrative leave this year.